Years ago, a friend of mine was called as a witness for the prosecution in a local magistrates court. Although the charges were relatively minor, the defendant was the son of the agent of a rather senior politician of the time. The evidence against the defendant was pretty conclusive, however he chose to plead not guilty – more than that, rather than be defended by a solicitor, he instead turned up with a barrister who seemed to have been hired in an attempt to try and get the young gentleman off the hook. The barrister then proceeded to pick through all of the evidence dragging the whole proceedings out, whilst at the same time giving out such an attitude of disrespect that by the end of it all, the magistrate was visibly annoyed at the whole farrago. As a result, the magistrate then handed down a sentence rather above what would have been given had the defendant just pleaded guilty. Along similar lines, we have another example of why you shouldn’t upset a lawyer – especially if you’re another lawyer – with the latest instalment of the Mark Brewer SPCK SSG story. One of numerous actions that got people annoyed was the fact that Brewer attempted to have SSG, a UK based charity, declared bankrupt in the USA, naming a non-existent US company as the entity being wound up – the belief being that it was being done to hide from the mainly UK creditors (it is worth mentioning that Brewer maintains that it is being done in the USA for other reasons). Needless to say, the court in the USA chucked out the case as being “in bad faith” – meaning that it was filed for a wrong or improper purpose – but not before a whole load of work had had to have been done. The non-existent company wasn’t the only odd thing about it though, among another of other aspects of the case that smelt fishy were the fact that Brewer’s own firm of lawyers were the ones acting for the non-existent company that he was trying to have declared bankrupt – so Brewer was both one of the people named as being part of the non-existent company, and also the lawyer acting in the case – and there was also another Brewer company called the ENC Shop Management Company that wasn’t even mentioned in the motion. Requests that Randy Williams expenses in dealing with the case be claimed back from Brewer. Accuses Brewer of incomplete disclosure, including using one of Dave Walker’s posts to highlight the ENC Shop Management Company that wasn’t mentioned in proceedings. â€œMr. Brewer and his firm engaged in a concerted scheme to mislead this Court and to file a bad faith bankruptcy case. Mr. Brewerâ€™s action in failing to disclose the true name of the Debtor and the cancellation of its contract and assignment of those rights to another closely held company of Mr. Brewer is a fraud on this Court. â€œFraud on the courtâ€? is an intentional act by an officer of the Court to deflect the Court from knowing all of the facts necessary to make an appropriate judicial decision on the matter before it.â€? Suggests that Brewer needs “20 hours of continuing legal education in the area of legal ethics”. States that “the filing of this case in the United States where almost every creditor is located in the United Kingdom brings disrepute to the Bankruptcy Courts of the United States as they are being used as a haven for a party attempting to escape justice”. That Brewer “seeks to use the designation of St. Stephen as a charity to somehow suggest that his conduct does not bear scrutiny”, before pointing out that the opposite should be true. Concludes that “creditors, especially those in a situation like this who are looking at the system from outside U.S. borders, can see that parties who would attempt to subvert the law to escape their responsibilities will be punished”. The whole impression of the document is that Randy Williams is really rather cheesed off. But putting that aside, the motion provides a lot that can be used back in the UK, and does seem to represent another spectacular backfire on Brewer’s part. Rather than quietly winding up the charity, the US court is now looking to punish him and his firm for bringing the motion in the first place. 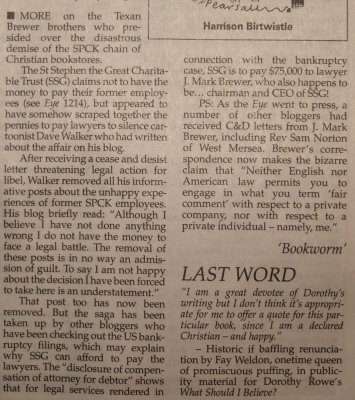 We now have a little bit of press coverage for the Dave Walker/SPCK story from outside the blogsphere – Private Eye has picked up on the story, plus the general ridiculousness around the bankruptcy. Thanks to David Keen, Sam Norton and SPCK/SSG News Blog for highlighting the Private Eye story. Things have progressed a little with the Dave Walker/SPCK story overnight with the publication of a great document by Matt Wardman. The document brings together copies of the original seventy-five posts from CartoonChurch, along with subsequent relevant posts and comment from other blogs, such that the document runs to a pretty epic 130 pages. However as an overview of the whole story it is invaluable. The document is downloadable from The Wardman Wire, and as it covers the same material as I have had published on my Evernote account, I’ll be removing those in favour of Matt’s document. Over the past few days I’ve tweaked the settings on the Dave Walker/SPCK Friend Feed room, such that it is now running with eleven feeds from various search terms that are pretty consistently picking up all relevant posts within a short time of them appearing online (the last time I manually added anything was Wednesday). In theory it should be de-duping between the feeds (although there have been a couple of hiccups) so it should be a fairly good way of keeping track. You can also hook up to a feed from the room which gives you a good way to have an overview of what everybody is saying. Outside of that there are a few interesting posts that have appeared. Firstly some of the others who were on the receiving end of cease and desist’s have broken cover, have a read of this post from Unicorn Tree Books and this one from the SPCK/SSG blog. There is also this one from SPCKWatch challenging Brewer to send a cease and desist to him, and including a couple of points from Brewers page that don’t appear to be exactly gospel truth. Why why why is this not being took on by the media more!! Sadly widespread media coverage has been sadly lacking up to now, and certainly over the past couple of weeks the media has been far more interested in a game of spot the schism… Fingers crossed that this will change now – certainly there are a couple of well known names who have either signed up to the Facebook group, or blogged in support of Dave. Whilst the removal of the posts was the catalyst, the more one digs into the story the more interesting it becomes, especially when you consider that some of our church buildings are ending up in the hands of these guys along with the SPCK shops.